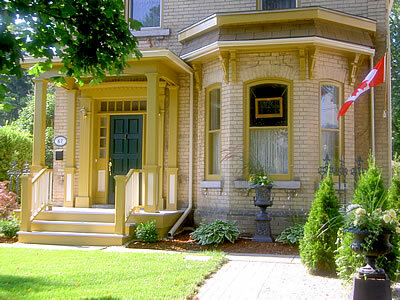 Buckingham House, a bed and breakfast in the heart of Stratford, Ontario, is a short walk from downtown shops, services, restaurants and the Avon and Studio Theatres. The Festival and Tom Patterson Theatres are within easy walking distance as well. On site parking is provided for guests. The house, built in 1880, is Italianate in design. Its exterior features include decorative brick details, high windows, overhanging eaves and period wooden bracket trim. The house received heritage designation under the Ontario Heritage Act in 2006. Interior renovations have brought the amenities up to date while preserving some original features and the house's inherent charm. Canadian and English antique furniture and art grace the rooms which are decorated in a Victorian palette. A full breakfast is served each morning in the bright and elegant dining room. There is a downstairs parlour and an upstairs sitting room inside for relaxation and conversation. Outside, a balcony, patio, pleasant gardens and a pergola provide guests with generous space to relax and enjoy the weather.